Have you ever heard of the experiment where a child is left in a room with a marshmallow and promised two marshmallows if they don’t eat the first one for fifteen minutes? I know I’m just guessing, but based on the time I spent chatting with María Luisa, I’m convinced she would have waited. She doesn’t like to break the rules. Ducking into a tunnel to get out of the rain. Photo by author. 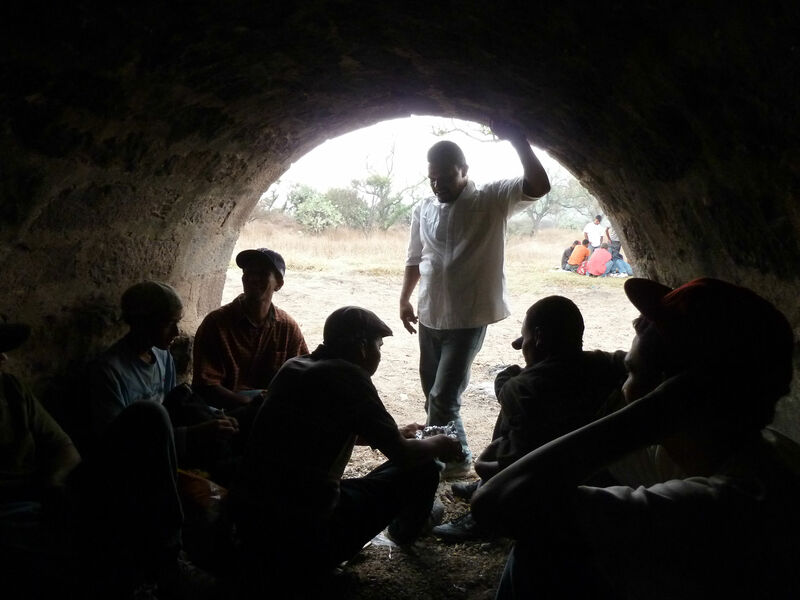 I was sitting in a tunnel under the train tracks near Mexico City with a group of about 25 Central American migrants when María Luisa looked at me and asked, “What do you think about all this?” When I mentioned forced migration – the fact that societal conditions create the necessity for people to leave their homes – she began to nod. María Luisa is from Honduras, but she’s been to Boston. In fact, she told me, she lived there seasonally under a guest-worker program for ten years. “I did it the right way,” she says, beaming with pride for her achievement. But she has been back in Honduras since a few years ago when she was no longer granted visas from the US government. Her employer had been helping her to apply for residency, but according to María Luisa, her lawyer was negligent and now she can’t even get a work permit. So she decided to stay in Honduras and help her mother. Between María Luisa and her father, the family got by. But then her father was murdered by the Mara Salvatrucha gang. She couldn’t find any work in her home country that would earn enough to support her and her mother. The train goes by later that day, too fast for the group to get on safely. Photo by author. “Nobody likes not to eat. Not to sleep. Not to bathe. The theives. The dangers.” María Luisa would much rather be at home in Honduras, and given that she has to leave Honduras, she would much rather be riding a bus or a plane with her passport and visa in hand. But as she told me over and over again, she feels this is her only choice left. And she is dismayed by those who would judge her for it. “Everyone has the right to work,” insists María Luisa. “Everyone has the right to a dignified job.” She has little sympathy for those who steal or fall into substance abuse. It’s fine with María Luisa if those people are banned from the USA, but not hard, honest workers like the majority of migrants. 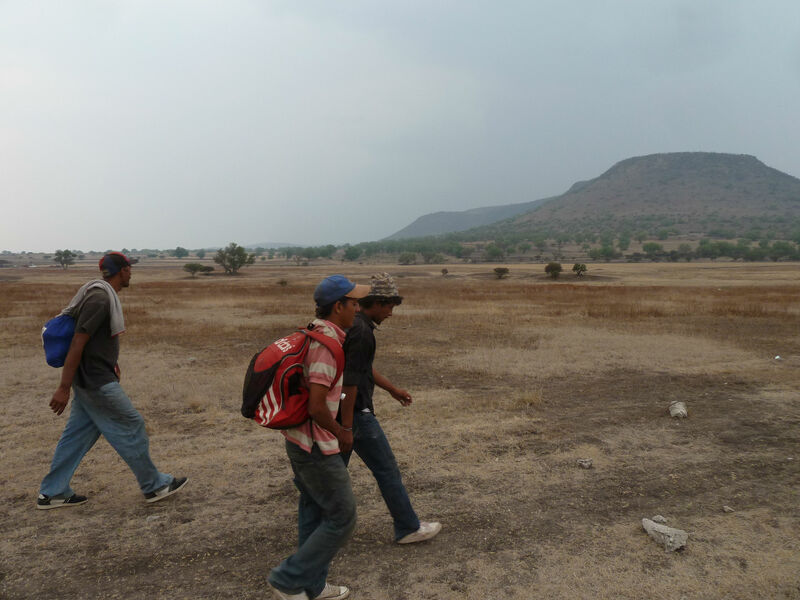 Migrants walk along the train tracks. Photo by author. 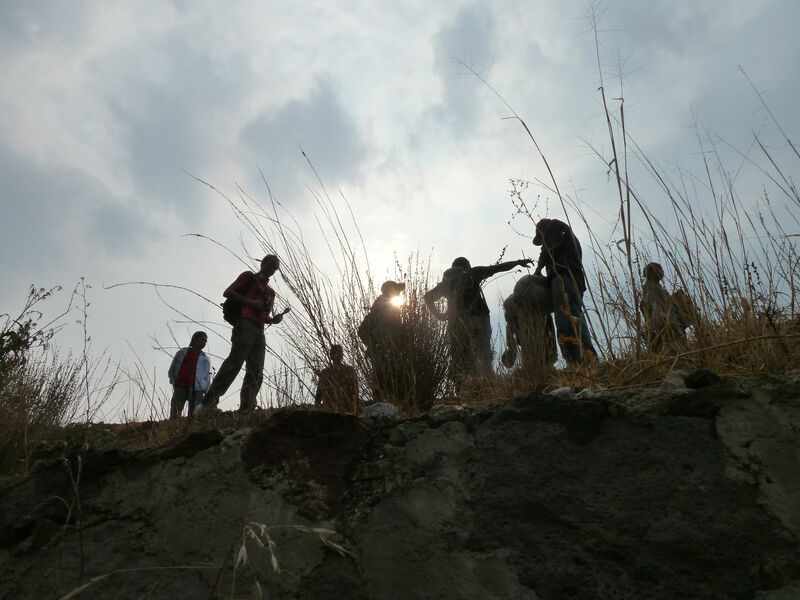 I step out of the tunnel where María Luisa and I had been sitting, our backs resting side by side against the cold stone wall with the other migrants – Hondurans, Guatemalans, Salvadorans. It’s drizzling lightly outside, and a few compañeros have started a fire to keep warm while they wait for the train to come by. Our location is strategic – there is a bend in the tracks, so the train usually slows down enough for them to hop on. It’s hard to believe that most of the migrants started this journey alone or in pairs – they appear to all have known each other for years. They laugh and joke together, they talk about their families back home (and for some people, “back home” is somewhere in the USA). And they help each other. They really take care of each other. 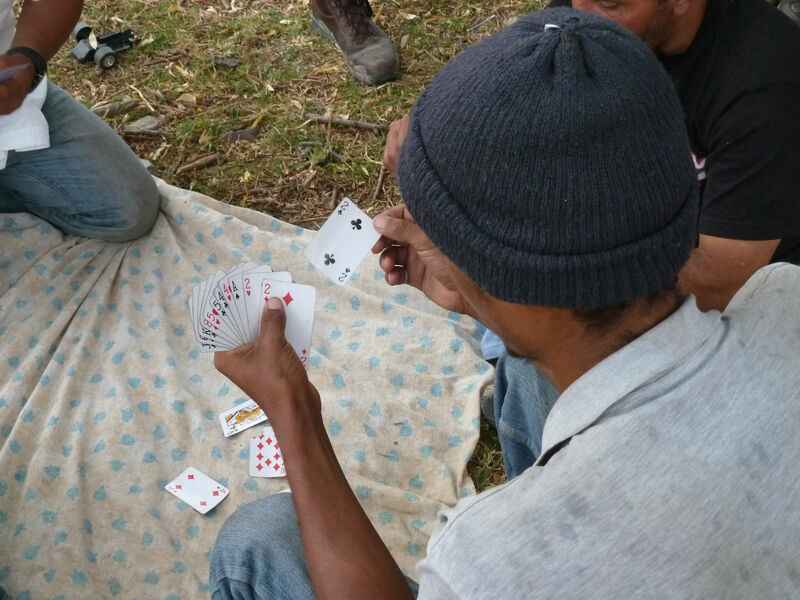 Migrants play “casino.” Photo by author. “Whose stomach hurts? 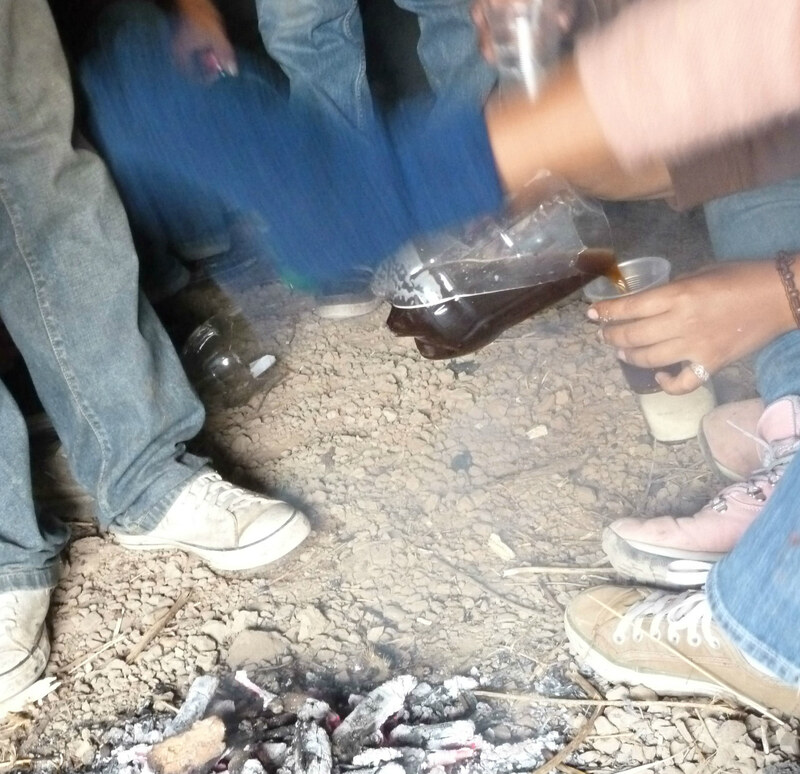 Somebody said their stomach hurt!” announces a Salvadoran woman, shouting to be heard over the sound of the men who laugh as they play a card game called “casino.” A young boy walks over, cradling his stomach, and they give him some pills that they got at a migrant aid building. Sharing a cup of coffee. Photo by author. One might expect that when you gather desperate situation upon desperate situation, you end up with a very desperate group of people. That hasn’t been the case with any of my interactions with migrant groups. Despite the fact that they all have harrowing stories – each one seemingly more astonishing than the last – they have been generous, jovial, and hopeful. It’s when they’re alone that their hardships are most visible. 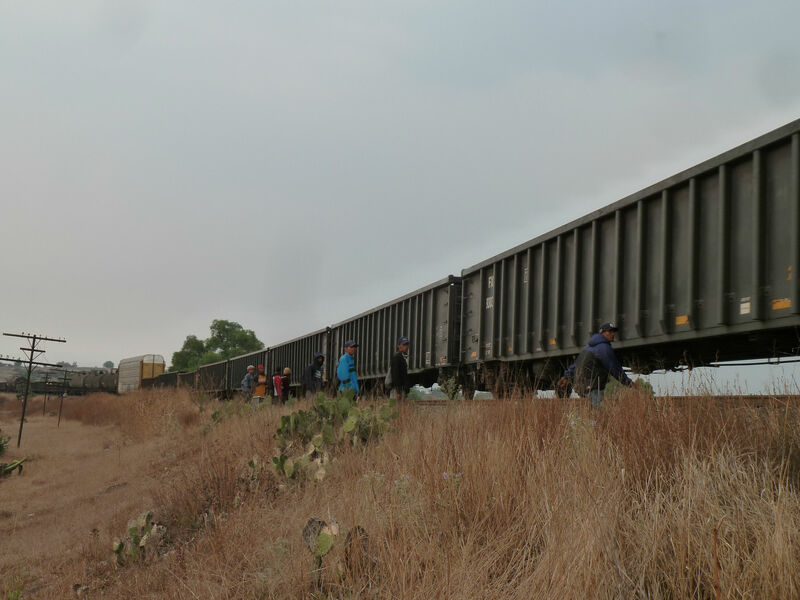 As we walked the tracks, I spoke with one Honduran who was deported four years ago. He had always intended to try to go back to the USA. “So why did you stay in Honduras for four years?” I asked him. “It’s hard to leave your family,” he said, smiling and pausing to think. “They didn’t want me to leave.” As he said this, his voice cracked and his smile broke. He turned away and walked alone as tears streamed from his eyes. For more information on the role of US intervention in forcing Latin Americans to leave their homes, check out Harvest of Empire, a book by Juan González. Democracy Now! recently shared some of that story and mentioned the current immigration reform debate – a critical issue for people like María Luisa, who prove that migrants don’t hop the fence because they’re criminals or because they won’t take the time and effort to immigrate legally. In her words, it’s their only option. Waiting for the train. Photo by author.